overlaid on the 4–20 mA loop. The Highway Addressable Remote Transducer Protocol, also known as HART, is a communications protocol which ranks high in popularity among industry standards for process measurement and control connectivity. HART combines analog and digital technology to function as an automation protocol. 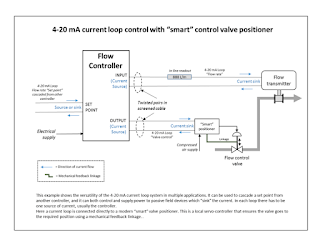 A primary reason for the primacy of HART in the process control industry is the fact that it functions in tandem with the long standing and ubiquitous process industry standard 4-20 mA current loops. 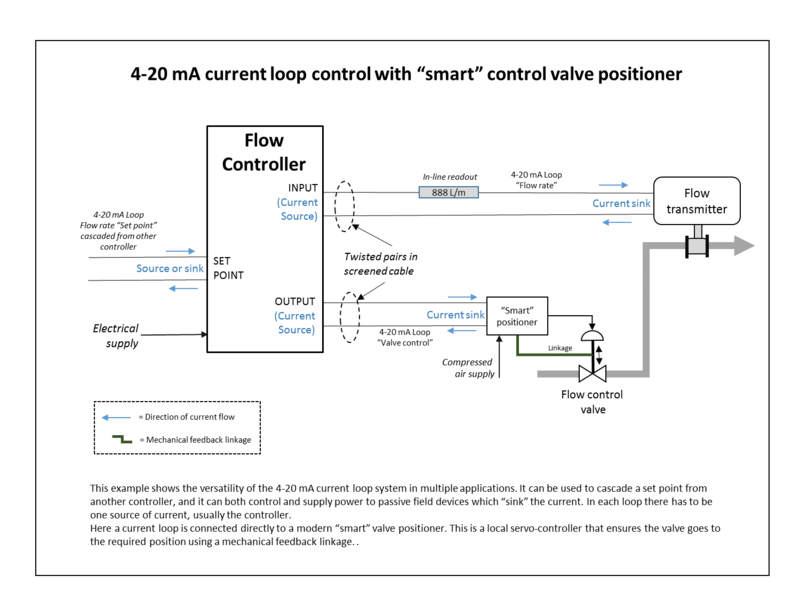 The 4-20 mA loops are simple in both construction and functionality, and the HART protocol couples with their technology to maintain communication between controllers and industry devices. PID controllers, SCADA systems, and programmable logic controllers all utilize HART in conjunction with 4-20 mA loops. HART instruments have the capacity to perform in two main modes of operation: point to point, also known as analog/digital mode, and multi-drop mode. The point to point mode joins digital signals with the aforementioned 4-20 mA current loop in order to serve as signal protocols between the controller and a specific measuring instrument. The polling address of the instrument in question is designated with the number ì0î. A signal specified by the user is designated as the 4-20 mA signal, and then other signals are overlaid on the 4-20 mA signal. A common example is an indication of pressure being sent as a 4-20 mA signal to represent a range of pressures; temperature, another common process control variable, can also be sent digitally using the same wires. In point to point, HART’s digital instrumentation functions as a sort of digital current loop interface, allowing for use over moderate distances. Velocity – A measurement of the speed at which a machine or machine component is moving as it undergoes oscillating motion. Various transducers are available that will sense and provide an electrical output reflective of the vibrational displacement, velocity, or acceleration. The specific unit of measure to best evaluate the machine condition will be dependent on the machine speed and design. Several guidelines have been published to provide assistance in determination of the relative running condition of a machine. It should be said that guidelines are not absolute vibration limits above which the machine will fail and below which the machine will run indefinitely. It is impossible to establish absolute vibration limits. However, in setting up a predictive maintenance program, it is necessary to establish some severity criteria or limits above which action will be taken. Keep in mind that guidelines are not intended to be used for establishing vibration acceptance criteria for rebuilt or newly installed machines. They are to be used to evaluate the general or overall condition of machines that are already installed and operating in service. For those, setting up a predictive maintenance program, lacking experience or historical data, similar charts can serve as an excellent guide to get started. As indicated earlier, many vibration signals are generated at one time. Once a magnitude of vibration exceeds some predetermined value, vibration signature analysis can be used in defining the machine location that is the source of the vibration and in need of repair or replacement. By using analysis equipment and software, the individual vibration signals are separated and displayed in a manner that defines the magnitude of vibration and frequency. With the understanding of machine design and operation, an individual schooled in vibration signature analysis can interpret this information to define the machine problem to a component level. Analyzing equipment to determine the presence of these problems is not a simple and easily performed procedure. Properly performed and evaluated vibration signature analysis requires highly trained and skilled individuals, knowledgeable in both the technology and the equipment being tested. Determination of some of the problems listed is less straightforward than other problems and may require many hours of experience by the technician to properly diagnosis the condition. 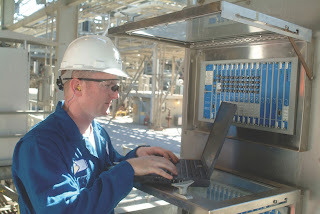 To learn more about vibration analysis and critical asset monitoring, contact Flow-Tech at 410-666-3200 or visit http://www.flowtechonline.com. 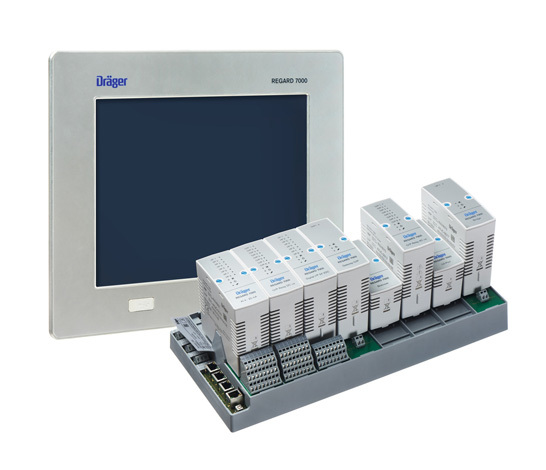 The Drager REGARD 7000 is a modular and highly expandable analysis system for monitoring various gases and vapors. Suitable for gas warning systems with various levels of complexity and numbers of transmitters, the Drager REGARD 7000 also features exceptional reliability and efficiency. An additional benefit is the backward compatibility with the REGARD. For more information in Maryland or Virginia, contact Flow-Tech at 410666-3200 or visit http://www.flowtechonline.com. Check out the video below to learn more about the Drager REGARD 7000. Thanks for watching. Dust explosion propagation testing at Fike labs. "Dust Explosion Propagation: Myths and Realities"
The unfortunate propensity of dust explosions to destroy entire facilities and claim lives has been reported in numerous past incidents. Powder handling processes are often comprised of interconnected enclosures and equipment. Flame and pressure resulting from a dust explosion can therefore propagate through piping, across galleries, and reach other pieces of equipment or enclosures, leading to extensive damage. This post will enumerate, illustrate and unravel 5 common myths about explosion propagation. Download the full Fike White Paper here, or read it in full at the bottom of this post. Myth #1: A large amount of dust is needed for an explosion to propagate. Dust explosions do not need large amounts of fuel to propagate. A 1 mm layer can create a dust explosion hazard in a typical room. The explosion only needed a 1/100 inch layer of dust on the ground to fully propagate. Myth #2: A dust explosion starting in a vented vessel cannot propagate through connected pipes. It is a common belief that protecting an enclosure, by means of venting or suppression, will affect explosion propagation in such a manner that no explosion isolation is needed at all. Although venting protects a vessel from the high pressures generated by an explosion, it does not necessarily prevent the explosion from being propagated through piping into other vessels. Myth #3: A dust explosion cannot propagate against process flow. An argument also often heard is that a dust explosion cannot propagate against pneumatic process flow. An explosion is capable of traveling both with and against process flow, even over long distances. Myth #4: A dust explosion weakens as it propagates. Literature includes numerous discussions about explosion behavior in interconnected vessels. Experimental evidence has shown that explosions not only propagate, but become increasingly more damaging. Myth #5: Small diameter pipes do not support dust explosion propagation. Dust explosion propagation in small pipes has always been a controversial topic. The primary argument being that flame propagation is challenged due to heat loss to the pipe walls. While conditions for dust explosions to propagate in relatively small diameter pipes are not yet fully established, their ability to propagate has been clearly demonstrated by several researchers. Contact Flow-Tech with any questions regarding explosion protection testing, isolation valves, vents and systems at http://www.flowtechonline.com or call 410-666-3200. Dust Explosion Propagation: Myths and Realities from Flow-Tech, Inc.